Your sensitive data. Where is it? What's happening with it and how can I protect it? Ask any security professional and they will list data loss as one of their top security and compliance challenges. 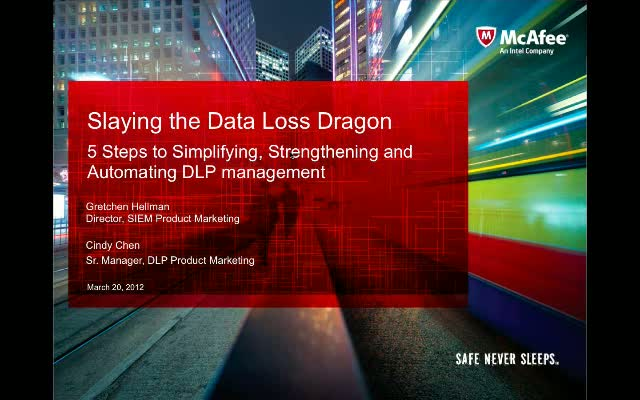 Gretchen Hellman and Cindy Chen with McAfee will discuss simple practices that integrate detection, monitoring and remediation to strengthen and automate DLP management. -Key chaos points in your data protection project and how to squash them with proven practices. -How to achieve continuous data governance through intelligently joining data loss prevention, monitoring and remediation.